Blended learning has gone mainstream. Once upon a time, classes that were conducted both online and face-to-face were taught by professors with IT experience. However, it seems that all teachers are expected to be able to teach with technology now. This expectation doesn’t always meet reality as face-to-face teaching techniques don’t always translate to your online teaching platform, Internet forums, social media, or chats and messaging. In fact, as Sharon Hartle, author of Keeping the Essence in Sight and experienced online teacher says, we really should call it blended teaching, not blended learning. It’s really the teacher’s job to adjust teaching methods to the format. One aspect of blended teaching (or blended learning) is the conducting discussions online. Many teachers, including Sharon, enjoy having a chance to chat in real-time, even if it’s over the computer. 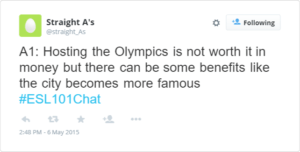 However, if you don’t structure online chats, they can be difficult to follow. This is particularly true if they’re done over Twitter, HootCourse (which Sharon prefers as it allows you to create a private chatroom), or a similar messaging app. First, you must have a way of ensuring everyone can “hear” each other. Second, because each participant is in their own room, people tend to type simultaneously. Third, different people use different software and websites to track discussions. Each method updates at a different pace. So the participants aren’t always seeing all the responses as soon as they happen. The result is people “talking” over each other, typing without being able to read all the responses. Others respond to old messages, which may or may not be clear. Quickly the conversation turns into several isolated threads with only a few participants each. One solution is to have students read the transcript later, but this defeats the purpose of a simultaneous chat. So Sharon proposes the structured chat. In a structured online chat, the moderator, likely you, the teacher, types a topic or poses a question. Participants may respond only to this question. This ensures that everyone is on-topic. After a set amount of time, or when discussion dies out, the moderator can pose a second question. And so on. Note that the questions may come from the textbook, the readings, an activity students have already been doing, or the teacher. But students may also have proposed them before the chat. Or evolve naturally from the chat. Having a moderator doesn’t necessarily mean the teacher is the sole dictator of the topics of discussion. And if you share the questions in advance, students can prepare answers and cut-and-paste them into the chat. This reduces their “talking” time, leaving them more time to read other responses. If students want to raise a different question, or shift the topic, they can raise their hands virtually. To do this, participants agree on a signal that means “hand raised/I have a question.” The question mark (?) is a great signal. You can also agree on a particular emoji (say, victory hand ✌). When the moderator sees this signal, they can write, “Ali has a question. Please post it now.” This tells the other students to stop typing and to pay attention to Ali’s feed. This ensures that everyone is answering the same question and that it is immediately clear if someone is responding to an earlier question, either because they want to bring up a new point or their tweets are loading slowly. 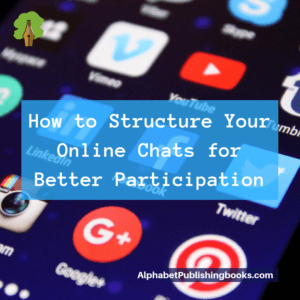 Feel free to share your ideas to structure online chats in the comments.